Zinc oxide is a fluffy white to yellow white powder having a very fine physical particle size (99.9% should pass a 325 mesh screen). Alot of zinc is used in crystalline glazes (typically 25%), because these have no clay content, they bring out the best and worst of both the calcined and raw materials. The raw zinc suspends glazes better (the calcined settles out significantly more). The raw zinc takes more water, but since the glaze can thin out over time it is better to add less than needed at mixing time and mix thoroughly. The raw zinc screens better (although it can be a challenge to get either slurry through an 80 mesh screen). Zinc oxide is soluble in strong alkalies and acids. It can be an active flux in smaller amounts. While boron dominates as the key flux in middle temperature glazes, for example, zinc is employed in some base glazes to augment the B2O3 or even replace it entirely. No combination of the common raw materials feldspar, kaolin, silica, feldspar, calcium carbonate, dolomite and talc will melt properly at cone 6, however, a 5% addition of zinc can transform the mix into a glossy glaze. 5% more and it will be a very fluid glossy glaze. The zinc can also significantly reduce the thermal expansion of the glaze it is fluxing. Zinc generally promotes crystalline effects and matteness/softness in greater amounts. If too much is used the glaze surface can become dry and the heavily crystalline surface can present problems with cutlery marking. Other surface defects like pitting, pinholing, blistering and crawling can also occur (because its fine particle size contributes to glaze shrinkage during drying and it pulls the glaze together during fusion). Zinc oxide is thermally stable on its own to high temperatures, however in glazes it readily dissolves and acts as a flux. Zinc oxide sublimes at 1800C but it reduces to Zn metal in reduction firing and then boils at around 900C (either causing glaze defects or volatilizing into the atmosphere; note that electric kilns with poor ventilation can have local reduction). While it might seem that zinc would not be useful in reduction glazes, when zincless and zinc containing glazes are compared it is often clear that there is an effect (e.g. earlier melting, more crystallization and variegation). Thus some zinc has either remained or it has acted as a catalyst. The use of zinc in standard glazes is limited by its price, its hostility to the development of certain colours and its tendency to make glazes more leachable in acids (although zinc itself is not considered a hazardous substance). 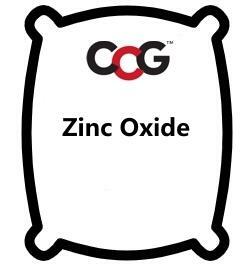 Zinc oxide is used in glass, frits, enamels and ferrites. Zinc oxide is also used in large quantities in the rubber and paint industries; in insulated wire, lubricants, and advanced ceramics.